While half of us were battling winter snow and cold during the month of February, and…ahem… half of us were bragging about the warm temperatures they were experiencing in the southern climates, it was a great month to catch up on some great real estate reads! Let’s start out with one of the most controversial topics…Open Houses! Todd Waller, self-proclaimed “destroyer of the real estate fortress of suckitude”, is a Realtor in Southeast Michigan. In what is probably my favorite article on the topic, Todd brings facts and an honest look at the strategy that’s necessary for a successful open house, and whether an open is even advisable. Todd declared an open house to be a sketchy real estate practice and you know what it probably is when real estate agents don’t explain their motives for holding one. As real estate agents we know what most will say ” I am here to sell your home Mr. & Mrs Seller. What you don’t know is that the agent is crossing their fingers behind their back. Realtors hold open houses to pick up additional clients! By the way this is perfectly fine just be honest about it. Please also let your client know that open houses present security risks. When anyone and everyone is allowed through the front door the chances of theft increase greatly. Seth Williams, Real Estate Investor, on his blog RE Tipster, has written a very informative post about real estate investing, addressing the skeptics. He highlights two independent success stories. This is a great read where Seth explains how to make money investing in real estate. If you have never read his blog and are thinking about investing make sure you do. One bought a home by paying the back taxes, then sold it a little over 2 months later for a profit of $7,600. The other investor shares 4 deals that involve land, for a total of approximately $180,000, before expenses. If you’ve ever considered investing in real estate, Seth’s blog and podcasts are a super resource. Sometimes we need a laugh. In Dave’s article he explores all the funny things we hear from clients about buying and selling real estate. His article hilarious things we hear in real estate is worth a read if you are looking for something to smile about today! Kevin Vitali, Merrimack Valley Mass Realtor, has written an article explaining Agency. There often seems to be confusion in the public about who an agent represents, or who they work for. Knowing why it’s important for the public to understand is another aspect that Kevin explains in this informative article, who does my real estate agent work for? What many consumers do not realize is agency laws differ from state to state. Some states don’t even have different types of agency. In Massachusetts where Kevin is based there is seller’s agency, buyer’s agency and disclosed duel agency. Kevin does a wonderful job of explaining each of these concepts. Juanita Limes, Greater Dayton Area Ohio Realtor, has written a story on the company blog, Berkshire Hathaway HomeServices – Professional Realty, about firing a buyer. I’m sure that most of us cringe at the thought, and many Realtors probably have never done it. But if you have a client who “leaves you wanting to pull your hair out,” you may do better by firing them. Read Janita’s story about how the same buyer came back, and came back repentant. If you are a real estate agent you probably realize that sometimes it is worth it to get rid of someone that takes more time than ten clients combined. The hard part is doing it but once it’s done the feeling can be gratifying. Making a mistake on your taxes can cost you real money coming out of your pocket. Who want to needlessly lose money? There won’t be many takers here. Fortunately for us and all their readers. Houselogic has a great (and timely) article that you’ll probably want to share with your social media followers. The article is nine easy mistakes homeowners make on their taxes. Are you guilty of making any of these blunders? Make sure you don’t! Verifying how much is available in the reserve fund. Find out if the complex is approved for FHA financing. Find out who is responsible for what. Work with a Realtor who understands that buying a condo is just a bit more complex than purchasing a home. Bill shares quite a few more tips when buying a condo but you will need to read his article to see the rest! In the last featured Google+ article for February I share fifteen myths about home buying everyone thinks are true. I had a really fun time putting together this post debunking 15 myths that I run into often. It seems that some erroneous information seems to live forever on the internet, and in people’s conversations. Homes are way overvalued – there is nothing I can buy in my budget. My house is worth more than my neighbors because……..insert your reason here. We are headed for another housing bubble. I am waiting for mortgage rates to fall. There are of course more but you will have to take a look to see the rest. With contributions from several excellent real estate bloggers, I hope you enjoy it! 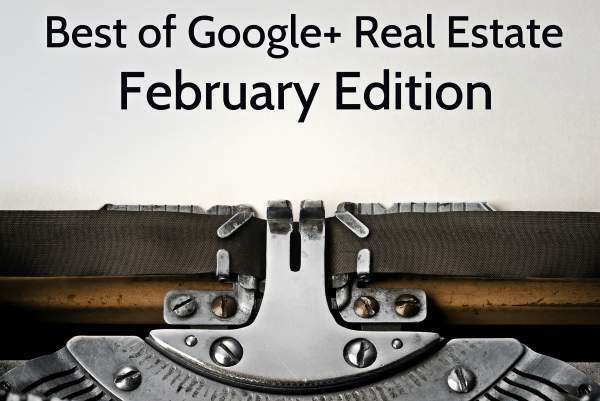 We hope you enjoyed February’s roundup of Google + real estate articles! This review was composed by Karen Highland, Frederick Md Real Estate blogger, with The Highland Group – Turning Point Real Estate. Thanks for the inclusion this month Karen – I really appreciate the mention! You’re very welcome Seth. I enjoy articles like yours, where the proof is spelled out with stories and evidence! Everyone did a great job.